Soon 2018 call. Don't miss it! 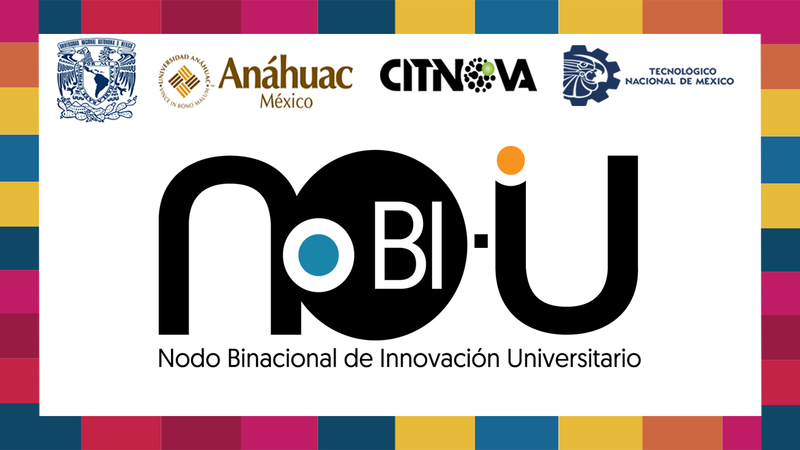 The Universitary Binational Innovation Nodes or NoBI U is an association let by different universities, such as, Universidad Nacional Autónoma de México (UNAM), Universidad Anáhuac, Tecnológico Nacional de México (TecNM) and Consejo de Ciencia, Tecnología e Innovación de Hidalgo (CITNOVA) They were created in 2017 with the participation of a bilateral innovation call from the National Council of Science and Technology (CONACYT) in Mexico, and the National Science Foundation (NSF) of the United States of America in order to create a network of 8 national Nodes. They are called binational because they collaborate between Mexican and USA counterparts. Mexican NoBI´s has implemented the I-Corps program (Innovation Corps) to researches teams, entrepreneurs and business mentors that belongs from institutes that integrate each NoBi´s. Make academic staff aware in research work for the importance of validation in business necessities or industry of interest. Evaluate the relevance of technological developments for its positive impact in Mexican society. Generate through market knowledge that the researches license their technology or the conformation of a Mexican business project. Its objective is to provide methodological tools, (i.e. lean startup), to researchers and students in order to identify problems in the industry of interest and be able to solve market needs by adapting their inventions or technologies created in laboratories from Mexican universities. I-Corps program consist on enable with knowledge and tools based on Canvas Business Model and Costumer Discovery of Lean Startup Methodology to academic teams and evaluate their commercial potential of technological developments, expanding its focus beyond their laboratories. This program helps researchers to design a technological marketing scheme or generation of companies around your research. I-Corps methodology make possible the validation for its feasibility outside the classrooms and generate solid business models with greater probability of success. Recognize the market validation importance, so their research results have a higher opportunity to get to society. Identify the significance of sounding out the market problems or needs, to offer technological solutions based on those requirements. Establish the technological maturity for each project through the analytical methodology known as Technology Readiness Level (TRL). Be trained on Customer Discovery, business model CANVAS and TRL. Identify the Critical Route to decide the next steps regarding the development, maturing or commercialization of their technologies.